After fighting a fierce war with an implacable adversary, cancer, John Richard (“Rick,” as he was known) Davies III, climbed his stairway to Heaven on Dec. 14, 2018, when he died at the McCarthy Care Center in Sandwich. Rick was born in Springfield on Valentine’s Day, Feb. 14, 1952, and was a charming guy. He was always a mischievous, fun-loving kid. While never attending college, Rick earned a Ph.D. in the school of hard knocks. 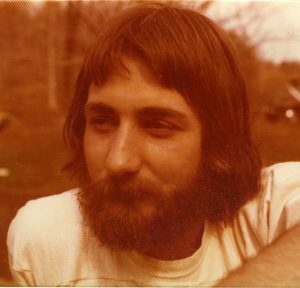 Rick started work at an early age, picking tobacco in the Connecticut Valley. He also tried his hand at lumberjacking, and one of his favorite jobs, exercising and riding horses in the Berkshires. Along with other family members, Rick moved to the Island in the late 1970s, learning many trades here, including carpentry, masonry, shucking scallops, and commercial fishing. Rick enjoyed riding his Harley-Davidson, and met and made many friends here. When he attended Harley-Davidson mechanic school, Rick lived in Arizona, then moved to California. A few years later, he headed back to the East Coast, and drove a cab in Miami with his father, Jack. Rick then moved to Bradenton Beach, where he was a short-order cook and a handyman at three Econo Lodge properties on the beach. After beating the demons of alcohol and drugs, he returned to the Vineyard in 2010, where he was reunited with his family and friends. Rick was a very spiritual man, and had great faith in God. He said his prayers daily, and was a communicant of Good Shepherd Parish. He had a great devotion to the Blessed Mother and St. Francis of Assisi. When his illnesses and surgeries limited his mobility, he would spend hours on the front porch, praying, watching the birds and squirrels at the front-yard feeders, feeding a couple of stray cats, and visiting with his friends. He enjoyed reading Conan the Barbarian novels and Louis L’Amour Westerns. In his last few years, Rick put together and painted with painstaking detail many model sailing ships. He was a talented artist, and gave his family and friends beautifully detailed pencil drawings of their homes. Rick spent many happy times with his mother, Louise, before her death in 2016, and felt so blessed to reconnect with his family. He was so proud of his daughters, his grandchildren, and his nieces and nephews. Thanks to his true and best friends David Berube, Tom Berninger, and Jon Devaney, Rick had a glorious 2018 summer, spending happy hours sitting in a Boston Whaler, poles in the water on Sengekontacket Pond. While they never caught a fish, he was just so happy to be out on the water with such great companions. Rick rarely complained even though he lived with excruciating pain the last 10 years of his life, and he was so polite and appreciative of the care and love of his family and friends. The family is extremely grateful to his caregivers who also became friends. Above all, we appreciate the love, compassion, and care that Dr. Gerry Yukevich extended to Rick. We are grateful to his home Hope Hospice caregivers, Joyce, Louise, Tanya, Keisha, Rachel, Erin, and most especially Liz and Melissa, and to the nurses who came in the middle of the night when needed, Cheryl and Sandy. We are grateful to the staff at the McCarthy Care Center who tried so hard to make his last hours comfortable. Thanks to Joanne and Donna, the social workers and Thad, his former counselor. We are thankful to Michele and Rosanne from Caregiver Homes, who provided guidance and assistance. Dr. Pieter Pil also took good care of Rick. We are especially thankful to Fr. Michael Nagle, whose daily visits at the end of his days gave Rick great spiritual comfort, and to the Hospice chaplain, Vera O’Brien, who sat and prayed with Rick for many hours. We are grateful to our Jersey “brother” Mike Hochman, who visited Rick every summer. Rick was predeceased by his parents, John and Louise Davies, his wife Susan, and his dog Beau. He is loved and missed by his daughters, Christine and Brenda, his sisters Deb and Tena, his brothers Billy (Robin), Doug (Paulee), and Gerry (Holly), his grandchildren Robert, Ryan, Alyssa, Becca, Kurt, and Sydney Morgan, and several great-grandchildren. He is also loved and missed by his aunt Sophia, his nieces and nephews Melissa, Erika, and Alicia and her husband Jon, and the sunshine of Rick’s life, their son Conner, Brianna, Max, Sydney, Chris, Nick, Matthew, Joe, Mike, Kiley, and Sam, his many cousins, and also by his good friends David, Tom, Jon, and Thorne, and Brian and Trader Fred, and Don and Peggy Dixon of Cortez, Fla. His beloved cat Miss Kitty and the family dogs, Baci and Daisy, miss him too. A memorial Mass will be held on May 18, 2019, at 11am at Our Lady Star of the Sea Church in Oak Bluffs, followed by a graveside service at the Sacred Heart Cemetery. In lieu of flowers, donations may be made to Good Shepherd Parish of Martha’s Vineyard, P.O. Box 1058, Vineyard Haven, MA 02568, or the McCarthy Care Center, 73 Service Rd., East Sandwich, MA 02537. Arrangements are being taken care of by Chapman Cole and Gleason, Edgartown Road, Oak Bluffs. Visit ccgfuneralhome.com for online guestbook and information.